Songwriters and superstars alike are helping those in need this holiday season. On board to raise much needed funds for St. Jude Children’s Research Hospital are Keith Urban, Buddy Jewell and Whitney Duncan. 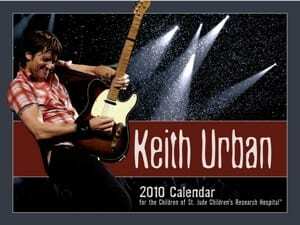 Urban and Jewell have 2010 calendars for sale to benefit the hospital through their Web sites. And Duncan is auctioning off the Versace gown she wore on the red carpet of this year’s CMA Awards in support of Country Cares for St. Jude, the auction runs through 12/19. Also on the auction block are handwritten lyrics from Emmylou Harris, Kix Brooks, The Fray and too many others to mention, benefitting the Americana Music Association. Cayamo has also donated a cruise for two on their Journey Through Song Caribbean Cruise, where Harris will be joined by John Hiatt, Lyle Lovett, Robert Earl Keen, Steve Earle and many others. Erin Enderlin, Leslie Satcher, Monty Holmes and Casey Beathard will play a benefit concert for the 2nd Squadron/278th Armored Calvary Regiment of the TN National Guard on Dec. 21 at Douglas Corner at 6pm. The cost is $10. The Loveless Cafe’s White Christmas With Suzy Bogguss & Friends will benefit Second Harvest Food Bank. Running nightly at 6 PM Dec. 20-23, there will be a concert, buffet dinner, and pictures with Santa Claus. Nonperishable food donations will also be accepted at the event. Visit lovelessbarn.com for more info. The Muzak Heart & Soul Foundation was scheduled to present a $2,500 Music Matters™ grant to W.O. Smith Music School at its holiday recital on Monday (12/14). Last weekend Kellie Pickler headlined a Country Crossing-sponsored concert at the Dothan Civic Center in Alabama that benefited the Wiregrass Area United Way Food Bank. Area natives Matt Kennon and Houston County also performed. More than $16,00 and 8,800 pounds of food were raised, translating to 92,134 meals. Carter’s Chord, Julie Roberts, Bryan White, Blaine Larsen, Rob Blackledge, Tammy Cochran, Regie Hamm, Mica Roberts, Trailer Choir, Natalie Hemby, and more raised funds for Christian child advocacy ministry Compassion International with a concert at the Mercy Lounge on Dec. 2. Michael Martin Murphey’s Cowboy Christmas in Longview, Texas (12/11), and his Bar-None Cowboy Christmas Ball in Tatum, Texas (12/12) raised $240,000 for Heartlight Ministries for troubled teens.